It had been five months since an Ebola death when Musa Kamara traveled to his hometown for festivities to mark the end of Ramadan. Not long after his sudden death in this roadside village, authorities came with a grim message: The killer virus was back. 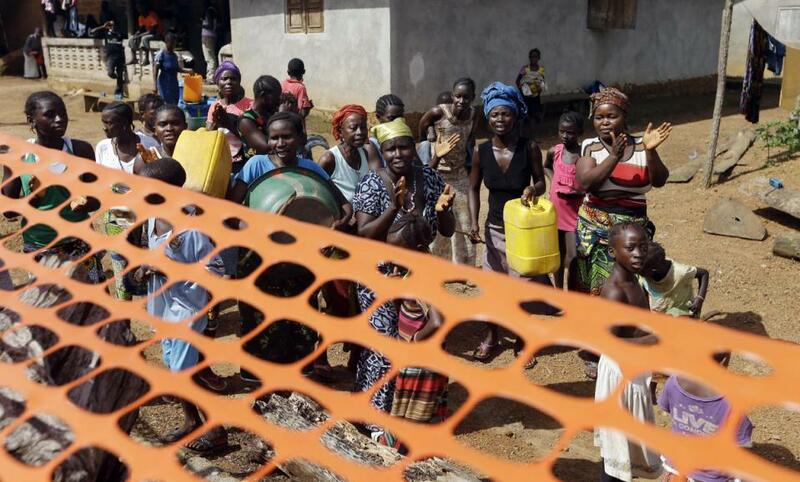 Soon officials barricaded this community of nearly 600 people, putting up orange plastic fencing to quarantine half the town for the 21-day Ebola incubation period after potential exposure. But late last week, residents who could only talk to family on the other side of the fence by phone erupted into song and dance when President Ernest Bai Koroma came to cut it down, marking the formal end of Sierra Leone's largest remaining quarantine. Alie Senkoh, 21, said he couldn't wait to "move all around town" after days of playing cards and dice at home with his aunt and grandmother. "We are feeling good because we are healthy and there is no more Ebola here," he said. "We believe this was the only way to stop the transmission." Even amid the jubilation, there was reason for caution. Authorities continue to monitor dozens of others who came into contact with 23-year-old Kamara, his mother and uncle, who later became infected. Both are recovering, health authorities said. The World Health Organization announced Monday that 43 people will remain in quarantine until the end of this week, while 38 others in the capital, Freetown, where Kamara lived, must stay in quarantine until Aug. 29. Officials desperately hope they can soon announce the start of the countdown to an Ebola-free declaration from WHO nearly 15 months after the first patient tested positive in Sierra Leone. After the last patient is released, the country must go 42 days — two incubation periods — before such a declaration can be made. The benchmark already was reached in Liberia, only for that country to face a brief setback when new cases emerged. Billboards plastered throughout Sierra Leone's capital still warn people to dial the 117 hotline to report all deaths, and others encourage families to "pray from at least one meter (yard) away" to avoid contact with highly infectious corpses. Yet there are signs the country is starting to let down its guard. The main road from the capital east to the second city of Bo and onwards to the town of Kenema still has more than half a dozen stopping points where passengers must undergo temperature checks. But hand soap is no longer put out with many of the hand-washing buckets that were once so essential. Koroma has warned Sierra Leoneans about such complacency amid the recent successes in the fight against Ebola. During his visit to this quarantined village, he reminded people how they had made it 150 days without a case "only to return to square one" when the latest victim was buried by his family before his diagnosis of Ebola was known. "You should report people who are sick and all dead bodies," the president urged the crowds celebrating their release. When Kamara returned to his home village, the family did not suspect Ebola. More than two dozen of his closest relatives were considered at high risk, though only his mother and an uncle developed Ebola. It was a much better outcome than initially feared when it was learned he had sought treatment at two health facilities before dying — and then had a traditional burial because the family did not think he had Ebola. Contact with bodies has been a major source of disease transmission since the first case emerged in neighboring Guinea in late 2013. While authorities have released most residents from quarantine, about a dozen of Kamara's relatives must remain inside their homes for another week until the incubation period has passed. His 21-year-old sister, Mamusu Kargbo, wiped tears from her eyes as she watched jubilant neighbors bang on makeshift drums made from empty water jugs, dancing and chanting, "Now we have our freedom!" Her brother, who sold eggs and other goods on the streets of Freetown, had been fasting for the holy month of Ramadan and said nothing about feeling unwell. Now he leaves behind a wife, a young son and other family back in his home village who counted on his remittances to eke by. "For us it is not yet over," she said of Ebola. "We have lost our brother and this is a big change for us to accept."